If you happen to be a part of Atlanta's urban music scene, you spend a lot of time in West Midtown on "studio row". The "row" is actually about a one mile radius encompassing Northside Dr and Howell Mill where you can find the offices of Ludacris's DTP record label, the legendary Stankonia (home of Outkast), and several other recording studios and management companies. Also within this radius is a host of pretty good restaurants like Flip Burger Boutique, Westside Pie, and Taqueria del Sol. Now, those places are great for lunch and dinner. But, if you're an early riser like me, you want a solid breakfast too. 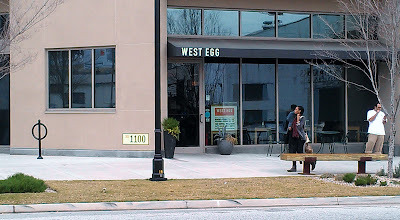 So, on this day, at the suggestion of my bro Big Cat, I pulled up at the intersection of Howell Mill and Brady Ave for some morning munchies at West Egg Cafe. Within about 50 paces of Compound nightclub, this rather large bakery/coffee shop/restaurant is a hip destination for commuters like myself. It's cozy and casual while still fly enough to distinguish itself from say an IHOP or a Starbucks. 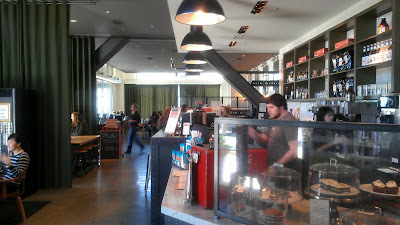 There is a very Midtown feel to the place - minimalist decor, finished cement floors, and large windows. Nothing too imposing. But, it does get busy. I've always had to wait a few minutes for a table. This day was no different. During my 10 minute wait for a table, I had an opportunity to linger around the bar/bakery area. While perusing the goods on display, I came across these Coca Cola cupcakes. I didn't get one BUT the curiosity of what these possibly taste like will definitely bring me back. 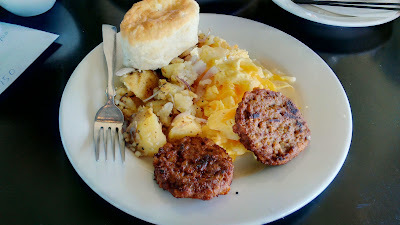 Once seated, our waitress immediately pointed us toward the Blue Plate (two eggs, biscuit, choice of breakfast meat, and a choice of either roasted garlic grits or skillet potatoes) and the Georgia Benedict (turkey sausage patties, two eggs, turkey sausage gravy over split biscuit, with choice of roasted garlic grits or skillet potatoes). 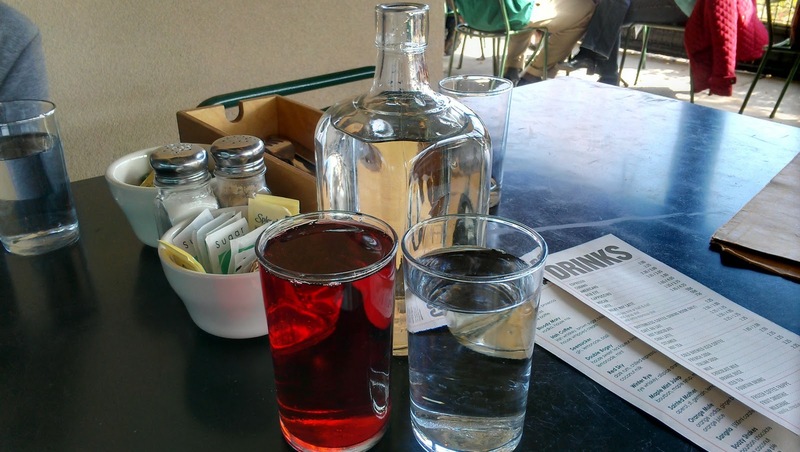 Not ones to fuss, we proceeded with our waitress's recommendations. The food arrives and everything looks great. So, we dig in. On my Blue Plate, the potatoes were great!!! Seasoned very well with onions and peppers mixed in. A couple of those onion pieces could've been smaller (there's nothing like biting into a big piece of onion. Ewww) but I was digging it. The eggs were scrambled lightly just like I like them. And, the biscuit was light and fluffy. Not bad at all. The Georgia Benedict should've come out with Young Jeezy as its' theme music. It was All White Everything. It looked like one big fried egg when it came out. But, according to my guest. It was A-okay. 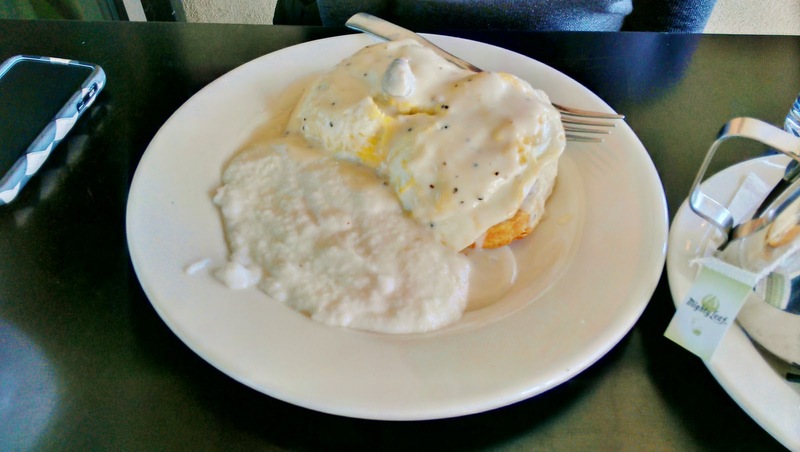 In fact, from my "extensive" Twitter research, the Georgia Benedict is supposed to be one of the most popular dishes at West Egg. But, we both gave a super side eye to the turkey sausage patties. It was dry and the taste was awful. Almost tofu-ish. Very disappointing. Almost enough to ruin the breakfast. But, everything was on point so we couldn't be totally mad. Overall, it was a solid breakfast. Again, besides the sausage, nothing was too bad. But, it wasn't the greatest breakfast I've ever had either. Just good enough to keep me coming back. I'd definitely recommend this to anyone in the city looking for a reasonably priced morning meal. Make sure you order bacon though. Lol. 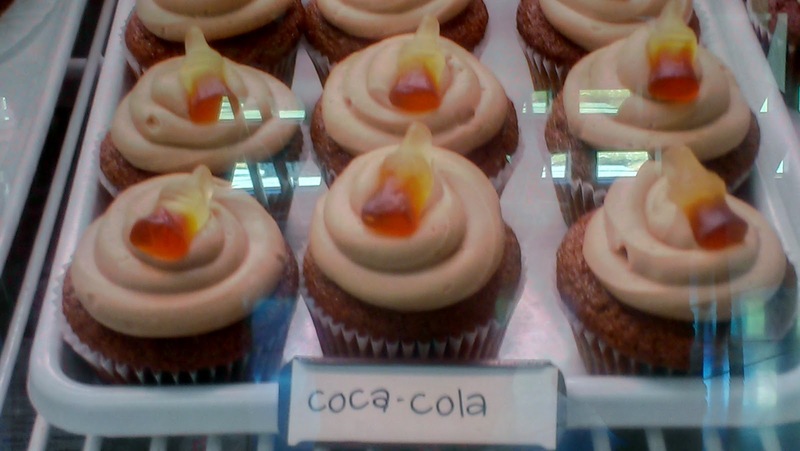 Oh, and if you get back there before me, try the Coca Cola cupcakes and tell me if they're good or not.